Well before the release of Crouching Tiger, Hidden Dragon in 2000, martial arts epics set in ancient Asia were incredibly popular. However it was Ang Lee’s classic tale of love and sword-play that thrust the sub-genre into Western cinemas with unprecedented popularity, resulting in even more entering production. Of these, Yimou Zhang’s Hero (2002) and House of Flying Daggers (2004) are noted as perhaps the most critically acclaimed with the Chinese auteur’s keen sense of colour and balletic style proving a winning formula for audiences. 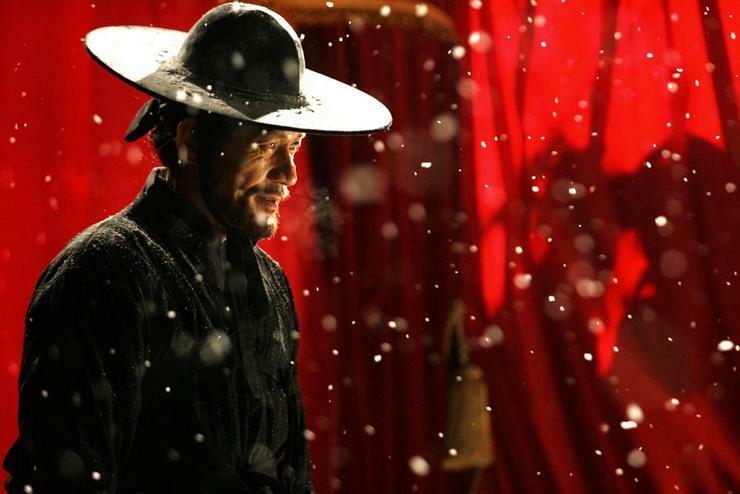 Lee Myeong-Se’s (이명세) Duelist (형사) is one of Korea’s forays into the martial arts epic, and as with most of the auteur’s films it will instantly polarize audiences between those with preconceived mainstream expectations, and those with more art-house sensibilities. Those who fall into the latter category will highly enjoy the exquisite mise-en-scene, abundance of visual metaphors and cinematic playfulness for which the director is renowned. 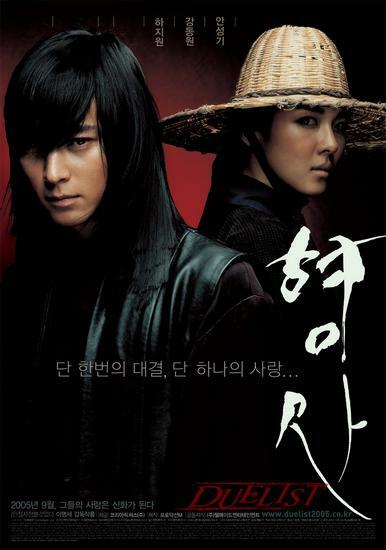 Set during the Joseon Dynasty, Duelist features Nam-soon (Ha Ji-won (하지원) and Detective Ahn (Ahn Seong-gi (안성기), officers working undercover trying to discover the source of a counterfeiting scandal that is disrupting the country by devaluing the monetary system. The duo track down a gang suspected of circulating fake coins to a market place, and a chaotic battle ensues. Yet before Nam-soon and Detective Ahn can apprehend the criminals, a performing masked swordsman enters the fray and murders all the suspects in an unbelievable display of grace and speed that shocks them all. Spilling a cartful of fraudulent coins to cover his escape, the swordsman flees yet is pursued by Namsoon who engages her target in battle wielding knives, proving herself to be equally as adept by cutting off a portion of his mask. Calling him Sad Eyes (Kang Dong-won (강동원), Nam-soon and Detective Ahn must track him down and halt the counterfeit operation before the hyperinflation destroys the country and the monarchy. Duelist is an absolutely stunning film, featuring sumptuous visuals and incredible cinematography. The locations are rendered with striking attention to detail, with wonderfully vibrant colours conveying the passion in the markets while shadows consume the back alleys with a noirish aesthetic. As has become expected of director Lee Myeong-Se (이명세), the highly articulate and almost playful artistic style extends to both the narrative and the technical proficiency and in doing so Sad Eyes and Nam-soon are constructed in terms of their opposing gender, offering a radically different stance on traditional action film conventions. Sad Eyes is feminised through his long hair, elegance and grace. His sword-play is mostly captured in slow-motion to convey his fluidity and finesse, while his calm demeanor adds a feminine charm that is simultaneously meek yet confident. Sad Eyes is also without a name, existing purely as image and a prize to be sought after, tamed, and dominated, attributes traditionally enforced upon female roles. As such, Sad Eyes becomes more beautiful than handsome, while his counterpart Nam-soon becomes more handsome than beautiful with her incredibly boisterous and hot-tempered characterisation. She curses, starts fights, and conveys mannerisms akin to a lower-class ruffian, even stalking Sad Eyes in an overt masculine fashion. The ambiguity of gender is enthralling with the role reversal offering an alternative perspective on traditional action and romantic narratives. Such romantic sentiments are expressed through their martial arts displays, as the fighting is more a highly choreographed dance than a duel to the death. Their styles match perfectly together, flowing and moving as if one, expressing the passion, anger, frustration and longing contained within them knowing that as officer and criminal their relationship can never be. The fighting styles also express their characterisation as Nam-soon’s passionate masculine fervour is contrasted with Sad Eyes’ restrained elegance, moving in and out of shadow, through regular and slow motions, and in the most beautifully poignant scene under gently falling snow. In addition to employing technical techniques to portray the artifice of cinema, Lee Myeong-se also emphasizes performance in this regard. Ha Ji-won’s tendency to over-act is superbly exploited in Duelist as her exaggerated mannerisms highlight the performance of masculinity, and the hypocrisy in the social acceptance of it for one gender and not the other. Her acting is also amusing particularly when she is forced to adopt a traditional feminine role through wearing hanbok and pouring tea for aristocratic men, the degradation and artifice of which she clearly loathes. Ahn Seong-gi is also required to over-act, yet his performance often alludes to mocking traditional authoritative patriarchal roles of the father figure and law-giver. His mannerisms are quite comical, usually reserved for sidekicks and jesters, undermining his position as authoritarian while simultaneously crafting Detective Ahn as kind and likable. As he functions primarily as image, Kang Dong-won gives a highly restrained performance allowing his mannerisms, eyes, and the mise-en-scene to convey his characterisation. He does so with incredible skill, conveying a feminine beauty and elegance that are impossible to miss. His eyes are indeed sad, especially when his identity and passivity are expressed, whereby he emerges comparable to a socially suppressed princess with an undesired fate. For cineastes with an appreciation of the aesthetics of cinema, Duelist is an incredible treat with its sumptuous visualization of the Joseon Dynasty era and the gendered role reversal of the leading protagonists. Rather than produce standardized mainstream fare, director Lee Myeong-se has crafted an elegant alternative perspective of martial arts action, making Duelist one of the most impressive contributions to the sub-genre and an outstanding addition to his exemplary filmography.